North Dakota may be an overlooked state due to the constant cold weather and long, tedious roads, but it actually has a fruitful economy and a plethora of job opportunities. Thanks to the oil reserves, unemployment in this state is relatively low. In fact, many people from other states are flocking into North Dakota for work. This state is also known as the number one producer of plenty of foods such as flaxseed, sunflower, barley, oats, lentils, honey, and so much more! 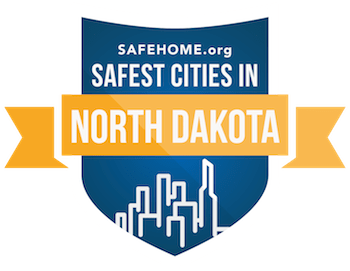 Not only are the job prospects wonderful here, North Dakota is also home to a good number of safe cities. Of the 25 scored cities in North Dakota, 18 of them have at least a Safety Score of 80. According to our list, New Town is the safest city in the state with an impressive score of 99.86! The population here is pretty small with 2,401 people. Most of this town is land. The majority of the population were either families with children or married couples living together. New Town is a great place to live because the real estate there is going up, all the while maintaining a relatively low cost of living. The average commute time here is 33 minutes, which means that residents can get in and out of town to where they need to be relatively easily. Because it’s such a safe city, it’s also a good place to raise children. Other cities that made it to the top 5 in North Dakota include Hazen (99.04), Oakes (97.93), Carrington (95.52), and Bowman (93.08). These cities all have pretty small populations (all under 4,000), which may play a big factor in why they received such high safety scores. North Dakota’s State Capitol, Bismarck also made it to our list of safest cities, ranking 12th with a score of 86.29. Considering that it is the second-most populous city in the state (population of just over 70,000), it is a pretty safe place to live. Fargo, North Dakota’s most populous city with 118,490 people ranks 24th on our list with a Safety Score of 73.92. Overall, North Dakota is not a bad place to live if you are looking for somewhere safe with plenty of economic growth.